Tangent Online currently reviews the following e-market quarterly publications (though some listed are defunct and we keep their reviews active). 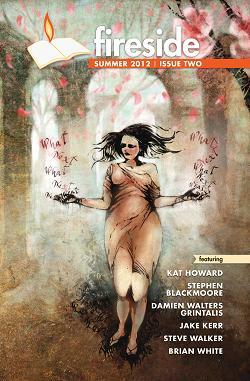 Aberrant Dreams is an electronic and print magazine of original speculative fiction. It was founded in February 2004 by Joseph W. Dickerson and J. Lonny Harper of Atlanta, Georgia. The first issue was released in October 2004. Within the confines of each issue, you will find fiction, poetry, and artwork of the fantasy, science fiction, and supernatural horror genres from talented established and upcoming authors and artists. Reviews of the previous, print issues of Challenging Destiny are located in our Print / Quarterly area. Constellary Tales debuted its first issue in November of 2018 as a quarterly ezine. Co-publishers and co-editors are Brian Hirt and Ken Gerber. The magazine posts original SF/F stories no longer than 3,500 words and pays 6 cents per word for its original fiction. Originally published from 2002 to 2006, Deep Magic returned to life in 2016. After two years of bimonthly publication, it now appears quarterly. The masthead describes it as "the e-zine of clean fantasy and science fiction." The editorial guidelines make it clear that the editors do not want stories with profanity or sexual themes. Although they also caution against graphic violence, some of the stories may contain scenes of war and killing. The magazine pays for fiction at six cents a word. It will accept stories up to forty thousand words in length, but payment reaches a maximum at ten thousand words. Farrago's Wainscot is a quarterly ezine seeking "weird literary' fiction from 2-4,000 words. Pay is 6c/wd. Between 2007 and 2009 it published 12 issues, then folded. The magazine was resurrected online in January of 2015 with its 13th issue. Fireside Magazine began as a quarterly e-book magazine in the Spring of 2012. In the words of editor Brian White: "Fireside is a quarterly fiction and comics magazine. Our goal is to publish story-driven fiction without regard to genre, and to pay the creative people involved (both writers and artists) at rates that help them make a living doing creative work." Future Science Fiction Digest is a quarterly online science fiction magazine edited by Alex Shvartsman. It is published in collaboration with the Chinese company Future Affairs Administration, features fiction newly translated into English from other languages, as well as original stories, nonfiction articles, and interviews with writers. Its contents are available online at no charge, published intermittently during the three months between issues. It pays 10 cents per word up to 10,000 words whether translated to English for the first time, or written originally in English. Its first issue debuted in December 2018. Grimdark Magazine is a new Australian pro-paying quarterly magazine focusing on "the darker, grittier side of fantasy and science fiction." Its first issue was dated October of 2014. Founder and editor-in-chief, Adrian Collins. Helix is a magazine of speculative fiction published electronically by the Legends group, an unincorporated association. Issues are published in January, April, July, and October. This can now be found at the E-Market/Bi-monthly section. The Endicott Studio Journal of Mythic Arts is an online journal for the exploration of myth, folk lore, and fairy tales, and their use in contemporary arts. Mothership Zeta debuted in October 2015 as a quarterly, pro-paying (6 cents/wd.) ezine, with a mandate of publishing "fun" stories. Samovar is a quarterly online e-zine featuring original stories translated into English, and also offered in their original languages. It will offer one original and one reprinted story in each issue, each in the original language and in English. Pay is SFWA's professional minimum rate of 6c/wd. up to 5,000 words. The first issue was dated March 27, 2017. Son and Foe is a quarterly publication (three months between each issue; four issues a year) which consists of over a dozen pieces of quality fiction, poetry, and art per issue. Along with original fiction, poetry, and art, Son and Foe will also feature carefully selected reprints to help flesh out the issue and bring more exposure to works that have not received the attention they deserve, or that have faded out of popularity in recent years, or that are just plain good. Spacesuits and Sixguns is a magazine of contemporary pulp fiction—simple, straightforward storytelling with an emphasis on action. UPDATE 3/27/2017: As of 2017 SQ Mag went from a bi-monthly e-zine to a quarterly e-zine. Past reviews can still be found at the E-Market/Bi-Monthly section link on the front page. SQ Mag is a quarterly e-zine published from Melbourne, Australia. It features one story by a well known, established author in each issue, along with approx. five stories from newcomers. Their primary mandate is the promotion of new talent. To learn more of this magazine, please visit their website. Subterranean Online is a quarterly companion to the print magazine. It pays pro-market rates for original fiction. TiconderogaOnline began as an original fiction offshoot from Western Australian quality independent publisher, Ticonderoga Publications, in 1999. It features bizarre, gonzo stories written by Australians—SF in the tradition of Howard Waldrop, Jack Womack, Tom Reamy and Alfred Bester.